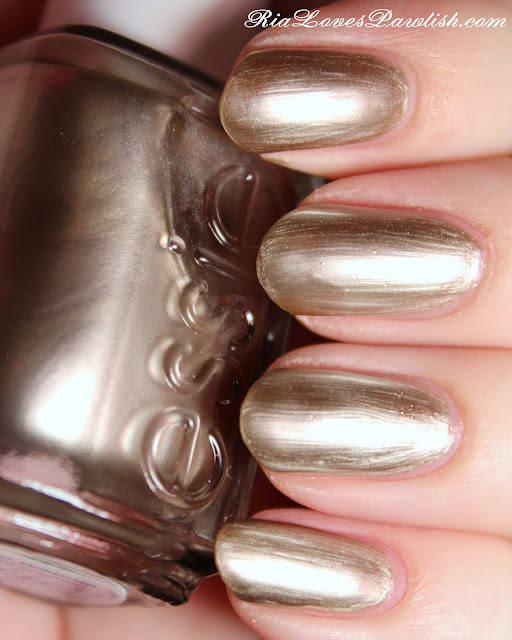 the polish we are looking at today is Essie Steel-ing The Scene. it's a champagne frost... and it is VERY frosty. the formula is okay, it's opaque in two coats but it does dry super streaky. unless you're a huge frost lover, i would say skip this one... i'm just not in a frosty mood today, i guess, because i usually dig frosts! when you are outside the brushstrokes are much less noticeable and a subtle shimmer appears... i wish the camera had picked up on the shimmer... too bad you can't be permanently outside while wearing this one! two coats STS, one coat Seche Vite.